Our introductory flight. View the Mount Rushmore Memorial from the most unique point of view. This 8 to 10 minutes tour lets you experience the National Monument in all its glory. Our most popular tour. This 12 to 15 minutes tour flies you to Mount Rushmore then follows Grizzly Bear Peak up past the Chessmen and back down to Horse Thief Lake. Our recommended tour for a budget-friendly vacation. 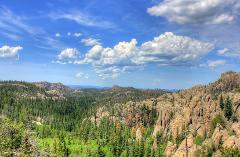 This 16 to 20 minutes tour flies you to Mount Rushmore then follows Grizzly Bear Peak up past the Chessmen, back down to Horse Thief Lake, and then up to Black Elk peak, the highest peak east of the Rockies. This 21 to 25 minutes tour flies you to Mount Rushmore then follows Grizzly Bear Peak up past the Chessmen, back down to Horse Thief Lake, up to Black Elk peak (the highest peak east of the Rockies), ending at the beautiful Sylvan Lake. This 25 to 30 minutes tour flies you to Mount Rushmore then follows Grizzly Bear Peak up past the Chessmen, to Black Elk peak (the highest peak east of the Rockies), by Sylvan Lake, down to the Crazy Horse Memorial and Cathedral Spires.